Every couple has a special way to celebrate the wedding anniversary. I think it depends on character, culture, opinion or life style. No one doubts at the moment husband and wife can celebrate it together family or closed friends become a happily married couple. This post aims to remind how a special day to be precious moment only together for husband and wife in bonding of marriage. I searched out the history regarding wedding anniversary in centuries ago. This known as a celebration to remind husband and wife in their blessed day which strengthen a bonding of relationship. This could be anniversary for certain periodically upon five years from fifth years to golden years or more, but not every year. In the modern age, the industry and capitalism used to manage a wedding anniversary things such as business. So now we live within modern ages. That seems easier to make celebration. Some ideas in below I did it, but I will consider the rest to think about. I have got the insights from colleagues or co-workers at office. 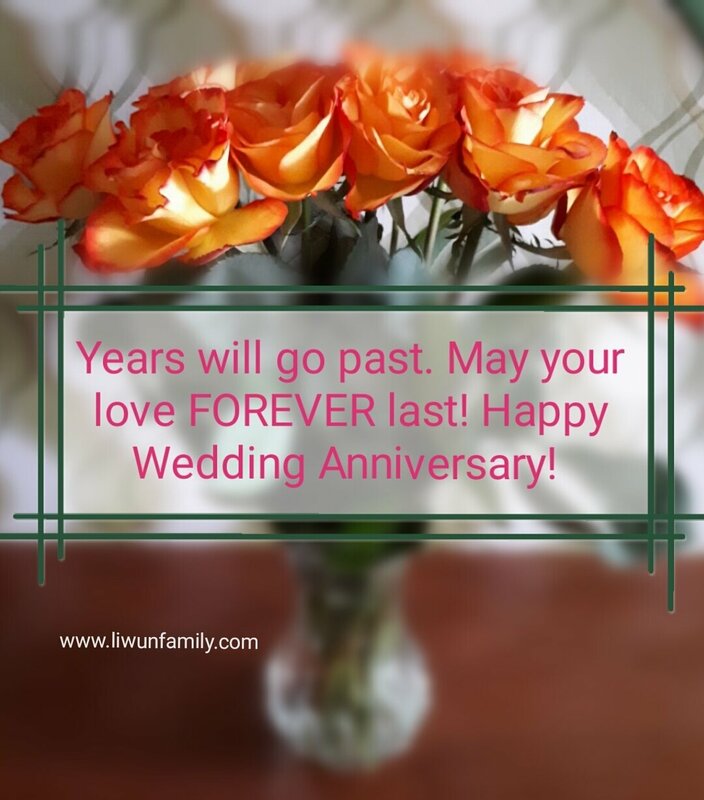 In supermarket or bookstore you can find a ton of wishing cards, including anniversary wedding. As wife I usually buy a card which contains motivational words about marriage. Or I had chosen a card which was a number of anniversary in cover. Then inside of card I wrote only “I love you.” A simple thing was been to my anniversary wedding in the past. It was so impressed for my husband. Do you love cooking? Lucky you! Go ahead trying some special recipes or secret menu as simple way. If no, why don’t try to cook together at home? Together with your spouse will learn a new recipe or favorite menu that always be found in restaurant. It is such a good idea than spending money in restaurant. This idea could be two things of placed to watch film together. First, you can come to theatre then choose a box movie in happening recently. Or second, decide it together what movie reminds you both as sweet memories in past ago. This sounds lovely at home. A friend of mine had idea to watch a video when they were on wedding on past years ago. Sweet! Candle light dinner in restaurant. A husband reserved a romantic dinner with a wife by calling to exclusive restaurant. I read this idea in magazine, so romantic! A husband had chosen the place near a window and sounding privately. One of musician came to play instrument during dinner. Wow! Make love in different ways. This activity sounds wild but some couples might to try it as lovely memories. Why not? Play drama or decide the ‘crazy’ idea together in bed. Praying and go to church. In Catholic Church usually conducts a schedule routine monthly for celebrating wedding anniversary. You will be allow to celebrate simple thing at Church in feeling grateful whatever happened in your life of marriage. Make a holiday in beach. Beach sounds a passionate place to celebrate your special day with a special one. I did in past. Choose a romantic package in Bali, then we didn’t bother with all stuffs during holidays. Don’t forget to take some photos as sticky memories! When you have no idea to go anywhere, try to buy something special for your spouse. I thought to buy a couple watches sounds marvelous idea. A watch is symbol of sincerity such as love as husband-wife. My parents did it, so cute is it? Try a new taste restaurant. One day, my co-worker would like to leave office earlier. The reason was in related with her wedding anniversary. She with her husband wanted to try a Mexican taste in restaurant. They never try it previously. This idea looks simple, huh! New taste for new way to celebrate long-lasting marriage. Send invitation to your parents and parents-in-law when you have anniversary wedding. This would be great idea in celebrating your wedding memories. It also looks like a bonding family. Family lunch could be involved your siblings inside or your best friends. You can make it at home or just simple thoughts to make it happen in restaurant. Get a second time honeymoon in cold place. Take the intimately time with your spouse in cold place such as mountain around. My colleagues at office stated a cold place brings you for a second honeymoon. What is your opinion about it? Write a love letter each other. This is insane idea as a person who is falling in love to someone. I did it. How to express your love through writing such as love letter or romantic poem. I urged my husband to do the same way then we were wondering to see how feeling happened.